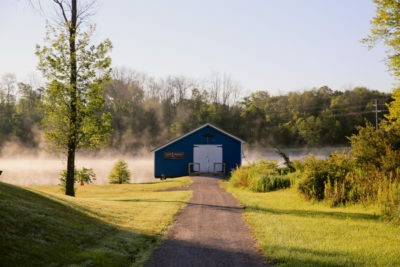 Mimi Dane was a successful law partner who gave up her practice to lead Flying Horse Farms, a Central Ohio camp that provides magical, transforming experiences to children with serious illnesses and their families—free of charge. This week, Kristy Eckert talks with the camp CEO about passion, purpose, good shoes and more. Q: Like far too many people, cancer affected your family, making camp’s mission very personal to you. Tell us how. A: Many moons ago, my nephew Damion was diagnosed with a form of bone cancer. He was a teenager. And he eventually died from it. I just saw when you have a child with a serious illness how it affects an entire family—both the parents and the relationship between the parents, and the healthy brother. 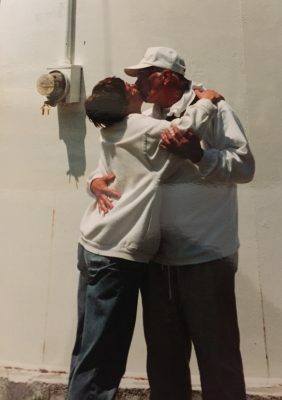 My brother dealt with a whole host of things, but I think part of the reason he eventually committed suicide was not getting over the depth of the grief of losing his son. It affected all of our family. 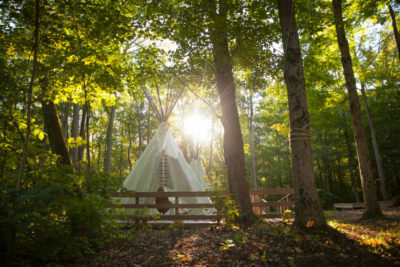 So I can see camp from a family’s point of view and what that means to siblings and parents and grandmas and grandpas. It’s why we offer campers for not just the children with illnesses but also a camp for well siblings plus weekend family camps. It’s not just the child who is treated at camp. It’s the whole family. The motto at Flying Horse Farms goes like this: Whether you’re coming or leaving, you’re always going home. Q: You’ve also battled cancer yourself. Can you talk about that? A: My own cancer story is not that consequential. I was diagnosed with breast cancer, and I had a lumpectomy and radiation. I was lucky I didn’t have to do chemo. It of course makes participating in the Komen Race for the Cure each year meaningful. Mimi celebrating a weekend camp arrival day with campers and volunteers. Q: Flying Horse Farms provides weekend and weeklong camp experiences to children with serious illnesses and their families. Many people think that camp, then, must be terribly sad. True? A: It’s the contrary! It’s the happiest place on earth. Camp –and I’m stealing this line from a parent—is the one place in the world that these kids and these families can come exactly as they are. It doesn’t matter if they’re in the midst of chemo or they’re different now because their brain has been radiated. We’re prepared to address every issue and make sure they are successful at camp. And even though it looks like it’s complete chaos because it is so much fun, every activity has intended outcomes. There’s not a thing at camp that is not fun, from meals to dancing to cabin chat. After I left the law firm, there was a video that I sent to my colleagues at the firm of me dancing in the pool. And one of my law partners said, “I hate you all over again.” It is pure joy here. 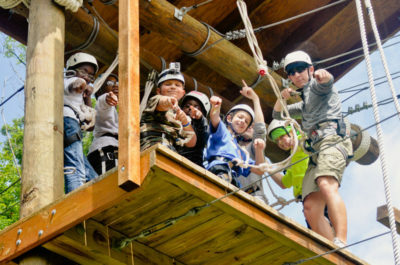 Campers on the high ropes course, where campers cheer each other on as they learn to conquer and overcome. Q: You’ve witnessed many incredible moments. What moment stands out as one that defines the work you do here? The Boat House and pond, where campers catch fish and paddle canoes. Q: And what’s the best part of your job? A: Walking into camp when campers are here. It may sound really corny, but this is home. These kids are coming home, and these parents are coming home. I love to be here for camper arrival and camper departure. For camper arrival, it’s to see the joy. And on departure day, it’s to see the dramatic change in these kids and their parents getting to see their kid in a new way. Q: Before camp, you practiced law for 25 years, and we know you had an affinity for good shoes. Any favorites? A: You can’t do that to me! [laughing] I rarely if ever put on a pair of heels, but Carrie Bradshaw would die to see my collection of flats. Favorites? I had been in New York for a gala, and the theme was cocktail with a touch of blue. 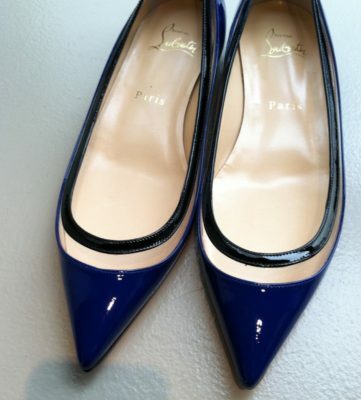 I went to Saks, and I had no choice but to get this pair of Louboutins that are blue with a little clear strip. [laughing] I needed a touch of blue! Q: You also have an affinity for good wine. What are your best recommendations for $25, $50 and a celebration? A: For $25, a William Fevre Chablis. It’s a French Chablis. For $50ish, hmmm. Probably a Williams Selyem pinot. And for celebrating something special, Sea Smoke One Barrel. It’s a pinot. Q: What is your favorite stress reliever? Q: You and your late husband, Emil, spent many summers in Martha’s Vineyard. What do you love about it? A: It’s a community. Our dear friends own a small cottage there, and it feels like camp in some ways—that every time I’m going there, I’m going home. It’s beautiful. It’s quiet. There are a lot of people that I’ve gotten to know there from Columbus. And there’s nothing like a run there. When I was going through radiation, to get through that, I just imagined this run going along the ocean to the lighthouse. It’s just a place of joy. Q: What is your ultimate Saturday? A: Sleeping in. Clintonville farmer’s market. A good walk. Pilates. Cooking. Swimming. Making some really, really good food. Having a glass of prosecco. Eating really, really good food. And having a couple glasses of wine with friends. Q: What is the greatest compliment someone can pay you? A: You were kinder than necessary. Flying Horse Farms Outpost, where teen campers get to spend one night sleeping under the stars. Q: Last but not least, we know Flying Horse Farms is hosting its annual 900 Smiles campaign this month. What is it—and how else can people help? A: 900 Smiles is an opportunity for people to purchase things we need at camp through our wish list on Amazon.com. We have items starting at $10, and if you buy them today, they’ll arrive quickly, we’ll open them, and they’ll probably be in use at camp within the week. It’s a really tangible way to help. People can help in many other ways, too. They can help by making Flying Horse Farms their beneficiary on AmazonSmile.com and at Kroger. They can help by volunteering at camp. They can help by joining us at our Campfire event next spring. 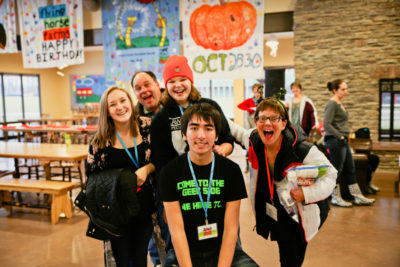 They can help by hosting what we call a “friendraiser,” where they have a cocktail party at home and we join to share the news about camp’s mission. They can help by inviting us to their corporations or groups to learn more about the mission. (Want details? Email lucy@flyinghorsefarms.org.) We absolutely need every advocate possible helping us raise more money so we never have to say no to another camper. But coming full circle, yes—I would love for you to give through 900 Smiles: www.tinyurl.com/900smiles. Thank you. And thank you to Wardrobe Therapy for their support throughout the years. We are grateful to count Elizabeth and her team as partners in helping change lives. To learn more about Flying Horse Farms and how to get involved: please click here. Elizabeth is the Founder & Owner of Wardrobe Therapy. 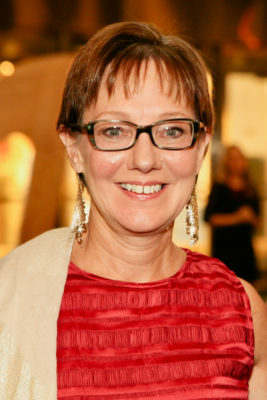 She founded the company in 2006 for individuals seeking help with their personal style and image.